Graduation greeting cards can be as unique as you want them to be. 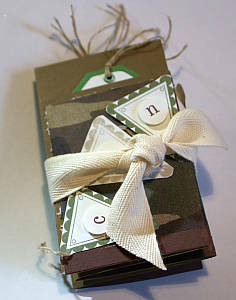 Consider making an accordion card to really make an impact with your heartfelt congratulations message. "Life is my college. May I graduate well, and earn some honours!" 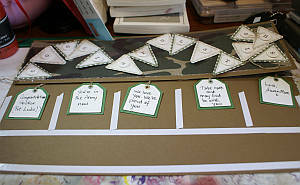 Making accordion cards for your graduation greeting cards is as easy as folding them over and back. I made a pocket accordion message here and will show you how to do it too. There's a place for you to show me your project at the bottom of this page. Scroll on down! I started with half an A4 sheet of cardstock cut lengthways so I had a long strip to work with. I covered that with designer series paper, leaving a small border around it. Then I worked out the maths of my message. The word "Congratulations" has 15 letters in it, and I had five folded card faces, so I knew I needed to have five panels with three letters on each. I scored my cardstock and designer series paper strip into five equal parts. 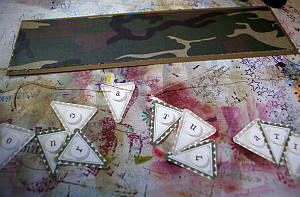 Next I stamped out my pennants and letters and punched them out to form my message, then strung them together with double sided tape and twine. 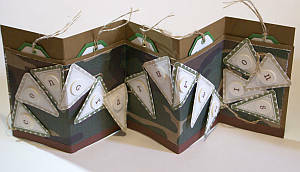 I placed the pennants in bunches of three on the panels of my cardstock and adhered them down. Some of the pennants overlapped and I decided that didn't matter. If you have a longer message, you might like to use A3-sized paper. 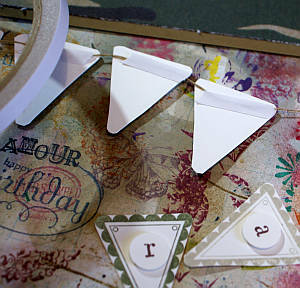 Next I made a second piece of scored cardstock to fit on the back of my decorated piece. I wanted to make pockets to hold some tags with more messages on them. 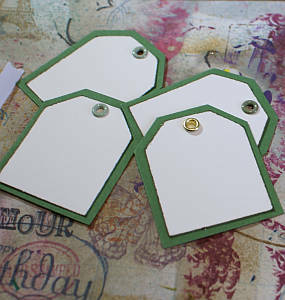 I made the tags first with a two different sized tag punches, adding some eyelets with my Crop-a-Dile and then adding some linen thread to link them all together. You could also use Baker's twine. Remember to write on your tags. I added messages that said how proud we were of our son, recognising his hard work and how far he had come, and how bright the future looked for him. Next I added double sided tape to form the pockets (use the score lines to guide you and the tags to measure the depth of the pockets) and add the front decorated piece to the back. Now fold along your score lines and stand up your card. 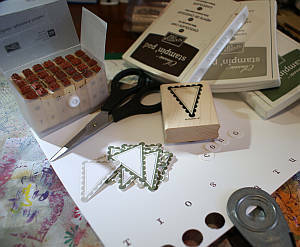 As you can see in the first photo, you can now fold the card up and tie it together with tape or ribbon. It will fit neatly into a box this way. You can see how to make the footlocker box under my 3d Papercrafts section. I'd love to see your Graduation Greeting Cards when you make yours!